Fayette County was organized in 1821 after the United States signed a treaty at Indian Springs, Georgia with the Creek people for cession of a large portion of their land. The county and its seat, Fayetteville, were both named in honor of the French aristocrat the Marquis de Lafayette, who aided General George Washington in the American Revolutionary War. 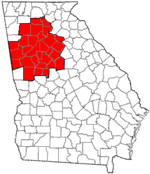 Since the late 20th century, Fayette County has been part of the Greater Atlanta Metropolitan Area. It is located south of Atlanta, which is based in Fulton County. Fayette County is minutes from Hartsfield-Jackson International Airport. As a suburb of Atlanta, Fayette County has increased rapidly in population and development since the late 20th century, nearly doubling its population since 1990. Both the county commission and the school board were elected members at-large from the county. The school board was one of only 20 boards, out of 180 in Georgia, that followed this system. Plaintiffs from the NAACP filed suit in 2011, charging that the system diluted their voting power, preventing the minority, who comprise 20% of the population, from electing candidates of their choice. The judge ruled in their favor and in 2013, a system of single-member voting was established, which the county and school board appealed. In 2014 the first African Americans were elected to the county commission and school board. In January 2016, the county and school board voted to settle the suit, as supported by the Chamber of Commerce. They have negotiated a system of four seats to be elected by single-member districts, with one at-large seat. Fayette County has five incorporated municipalities within its borders; Fayetteville, Brooks, Woolsey, Tyrone and Peachtree City. Formerly, Inman was also a municipality, but gave up its charter years ago. In 2015 Fayetteville, a majority-white city, elected its first African-American mayor, Ed Johnson. In 2011 he had been the first African American elected to its city council and only the second African American elected to any office in the history of Fayette County. Fayette County was created on May 15, 1821, from territory ceded to the United States by the Creek people, who had historically inhabited the area. It was named for the Marquis de Lafayette, French hero of the American Revolutionary War. Located in the Piedmont, the county was originally developed by planters for cotton cultivation, using enslaved labor for this commodity crop. Agriculture continued to be important into the early 20th century. In the years following World War II, the county developed suburban residential communities, with many workers commuting to Atlanta. Peachtree City was chartered in 1959. It was developed as the only planned community in the county and in the Southeast; it covers 16,000 acres. The county population has increased rapidly during the late twentieth century with the growth of Atlanta. It has also benefited from a reverse migration of African Americans to the South, as new residents are attracted to jobs and opportunities. Significant growth and development continues. In 2002 Charles "Chuck" Floyd was appointed to the position of Chief Magistrate Judge of the county. In 2004 and 2008, he was elected to the position in his own right, the first African American ever elected to any office in the county. Fayette County's local government is led by a board of five county commissioners, known as the governing authority of Fayette County. Since March 2016, four seats are to be filled by election from single-member districts and one at-large from the county. Until 2013, the county was divided into three "county commission districts." Three of the members of the board of commissioners were required to live inside one of the designated districts. The remaining two commissioners could live anywhere in the county. All members of the county commission were elected "at-large," which meant that each candidate had to attract the majority of votes across the county in order to win. Since 1982, more than 100 cases of such at-large voting systems in Georgia have been replaced by single-member districts. The five members of the school board were also elected at-large. In the early 21st century, Fayette County was one of only 20 school boards among 180 in the state of Georgia to maintain at-large voting to elect members of these boards. The practical effect was the exclusion of African Americans from these positions. The county has been majority-white and majority-Republican since the late 20th century. Neither Republican nor Democratic African-American candidates had any electoral success. In 2011 the NAACP and several African-American county residents filed suit against the county and the board for the at-large voting system. In May 2013, the federal district court ordered the county and school board to change their systems of at-large voting, finding that it violated the Voting Rights Act of 1965 by diluting the voting power of the minority. African Americans make up 20% of the county population but were unable to elect candidates of their choice, as every commission and school board seat required a majority of county voters. The county has a majority-white, majority-Republican population. Under the federal ruling, five districts were established so that members of both the school board and county commission are elected from single-member districts. This broadened representation on the boards. Voters of each district elect a commissioner living within its boundaries. In 2014 Democrat Pota E. Coston was elected as the first black county commissioner in the 194-year history of the county. Leonard Presberg was first appointed and then elected in his own right as the first African-American member of the school board. After Coston died in office, the Fayette Board of Elections voted to use at-large voting in a special election to replace her. The NAACP returned to court as it opposed using the former system. Judge Batten ruled that the county had to use the single-member district system established by his earlier ruling. In September 2015 Democrat Charles Rousseau was elected from District 5 to succeed Coston, becoming the second African American elected to the county commission. In October 2015 the Fayette Chamber of Commerce and two prominent white leaders urged the county to settle the nearly five-year lawsuit and accept district voting. Judge Batten ordered the two sides into mediation and postponed the bench trial. In January 2016 the Fayette County School Board voted unanimously to settle the lawsuit and accept district voting for election of its members. The County Commission voted to settle by a 3-2 vote. Together with the NAACP and black county plaintiffs, the county commission agreed in January 2016 to a system of electing four members from single-member districts and the fifth as an at-large member. A law implementing this change was signed by Governor Nathan Deal in March 2016. According to the U.S. Census Bureau, the county has a total area of 199 square miles (520 km2), of which 194 square miles (500 km2) is land and 5.0 square miles (13 km2) (2.5%) is water. The Flint River passes through the county and provided the earliest route for transportation and shipping of commodity crops. The entirety of Fayette County is located in the Upper Flint River sub-basin of the ACF River Basin (Apalachicola-Chattahoochee-Flint River Basin). Based on the 2010 census and 2013 estimates, Fayette County has 108,365 people. The racial makeup of the county was 71.7% White; 21.4% Black or African American; 0.4%	Native American, 4.3% Asian, 0.1% Native Hawaiian and Other Pacific Islander; and 2.0% Two or More Races. 6.9% of the population was estimated as Hispanic or Latino of any race. As of the census of 2000, there were 91,263 people, 31,524 households, and 25,975 families residing in the county. The population density was 463 people per square mile (179/km²). There were 32,726 housing units at an average density of 166 per square mile (64/km²). The racial makeup of the county was 80.96% White, 12.87% Black or African American, 0.21% Native American, 2.42% Asian, 0.02% Pacific Islander, 0.76% from other races, and 1.25% from two or more races. 2.83% of the population were Hispanic or Latino of any race. There were 31,524 households out of which 43.10% had children under the age of 18 living with them, 71.50% were married couples living together, 8.30% had a female householder with no husband present, and 17.60% were non-families. 15.00% of all households were made up of individuals and 5.50% had someone living alone who was 65 years of age or older. The average household size was 2.88 and the average family size was 3.20. In the county, the population was spread out with 29.10% under the age of 18, 6.50% from 18 to 24, 27.70% from 25 to 44, 27.80% from 45 to 64, and 8.90% who were 65 years of age or older. The median age was 38 years. For every 100 females, there were 95.80 males. For every 100 females age 18 and over, there were 92.00 males. The median income for a household in the county was $71,227, and the median income for a family was $78,853 (these figures had risen to $79,498 and $89,873 respectively as of a 2007 estimate). Males had a median income of $54,738 versus $33,333 for females. The per capita income for the county was $29,464. About 2.00% of families and 2.60% of the population were below the poverty line, including 2.80% of those under age 18 and 4.60% of those age 65 or over. As of the 2010 United States Census, there were 106,567 people, 38,167 households, and 30,288 families residing in the county. The population density was 548.3 inhabitants per square mile (211.7/km2). There were 40,793 housing units at an average density of 209.9 per square mile (81.0/km2). The racial makeup of the county was 71.1% white, 20.1% black or African American, 3.9% Asian, 0.3% American Indian, 0.1% Pacific islander, 2.3% from other races, and 2.2% from two or more races. Those of Hispanic or Latino origin made up 6.3% of the population. In terms of European ancestry, 15.0% identified as English, 14.0% as German, 13.0% as Irish, and 8.1% simply as American. Of the 38,167 households, 39.5% had children under the age of 18 living with them, 65.7% were married couples living together, 10.3% had a female householder with no husband present, 20.6% were non-families, and 18.1% of all households were made up of individuals. The average household size was 2.78 and the average family size was 3.15. The median age was 42.4 years. The median income for a household in the county was $82,216 and the median income for a family was $92,976. Males had a median income of $68,381 versus $46,140 for females. The per capita income for the county was $35,076. About 3.4% of families and 4.7% of the population were below the poverty line, including 6.1% of those under age 18 and 3.8% of those age 65 or over. Fayette County is served by the Fayette County School System. The governing authority for the school system is known as the Fayette County Board of Education, a board of five elected persons. They hire a superintendent to manage daily operations of the schools. Since a federal court ruling in 2013, resulting from the federal voting rights lawsuit described above, the five board members are each elected from single-member districts. In January 2016 after mediation, the school board voted unanimously to settle the lawsuit they had earlier appealed along with the county. The board accepted single-member districts for election of board members. In 2015, the majority-white city of Fayetteville elected its first African-American mayor, Ed Johnson. Described as a "bridge-builder," Johnson is a retired naval commander and pastor of a black church; he was elected in 2011 as the first black on the city council. Robert H. Brooks, former Chairman and CEO, Hooter's of America Inc.
Mike Duke, Former CEO of Wal-Mart Stores Inc.
Ferrol Sams, physician, humorist, storyteller, and best-selling novelist. ^ a b c "State & County QuickFacts". United States Census Bureau. Archived from the original on July 10, 2011. Retrieved June 22, 2014. ^ "Population and Housing Unit Estimates". Retrieved March 22, 2018. ^ "Fayette County, Georgia – Fact Sheet – American FactFinder". Factfinder.census.gov. Retrieved 2010-07-22. Fayette County Historical Society, The Fayette County Georgia Heritage Book (Waynesville, N.C.: Walsworth, 2003). This page was last edited on 20 April 2019, at 04:00 (UTC).